“I was born on March 11, 1921, in Belleville, IL, to Frank and Mary (Ripp) Hoffman and was given the name Marcella,” explains Sister Michaeline Hoffman. “My father was an auto painter, my mother was in charge of a house and eight children, and my two fondest childhood memories were playing softball, along with other sports, and celebrating Christmas Eve at home with my family.” “We were poor but didn’t know it – we had everything we needed and were blessed in many ways,” she said. 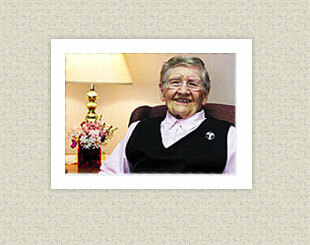 Throughout her life, Sister Michaeline wanted to try new things, and that’s exactly what she did. She encountered experiences, had fun along the way, and found the path to religious life. God didn’t announce this idea with any fanfare, nor can she recall any specific thing that lead to her decision. Bottom line: she took the step. “When I talked with my parents about my decision to become a Hospital Sister, my mother was concerned and said ‘you can’t keep a hat on even in winter, how can you keep a veil on your head?’ I soon learned that nothing is impossible with God,” Sister Michaeline said with a smile. She professed her First Vows on October 4, 1943.